Kate brought back a favorite piece for today’s engagement at the Anna Freud Centre. …The Anna Freud Centre is working to reduce the burden of mental health difficulties of children and young people. The Centre provides a range of clinical services, specialist teaching and training for practitioners and pursues a programme of cutting edge research. Some may recall Kate’s first solo engagement after Charlotte’s birth was at the Centre’s Family School in mid-September. 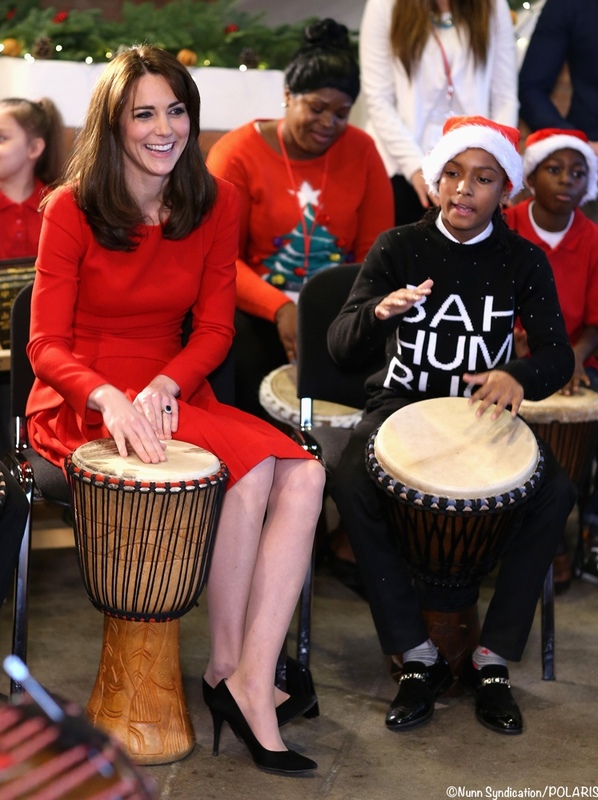 The future Queen, hilariously, played Queen, tapping out the band’s anthem We Will Rock You‎ during a session on West African goatskin Djembe drums at the Anna Freud Centre in Islington, North London. 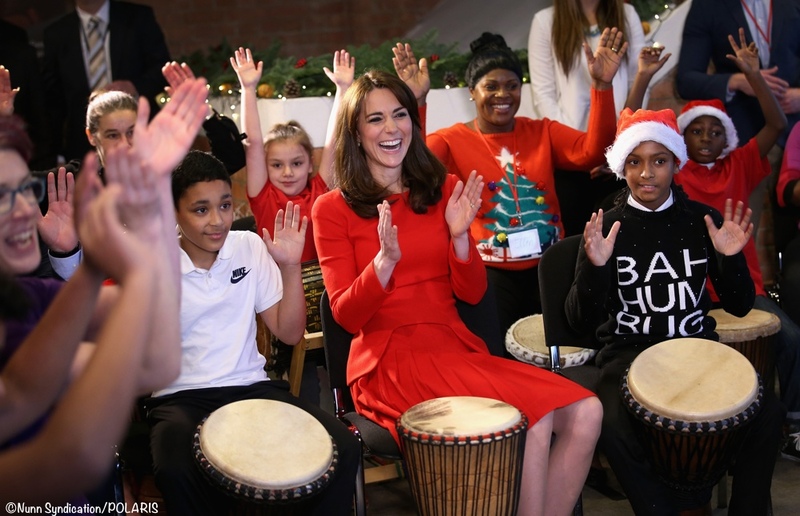 Holding a bongo drum between your legs is all but impossible in an Alexander McQueen dress, so the Duchess of Cambridge invented her own “sidesaddle” technique as she joined children at a Christmas party today. The Duchess is not thought to be a keen football fan but when she visited the same pupils in September, some of the pupils came away with the impression she followed the same team as her husband, Prince William: Aston Villa. 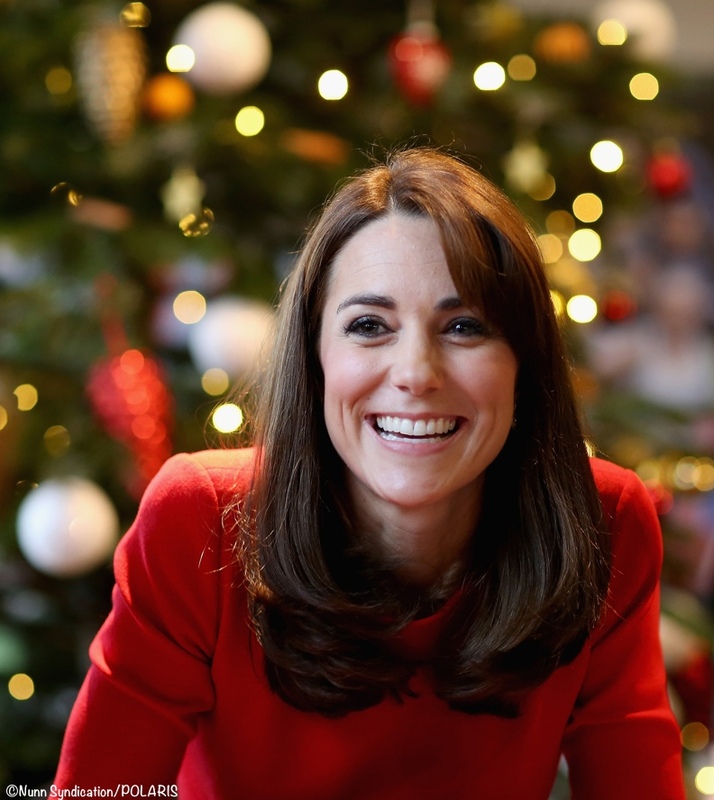 But when Rjay‎ Bryan, eight, chatted with her today about William’s support for Villa, the Premier League’s basement team, he then asked which team Kate favoured. ‘We high fived because she supports Chelsea and I support Chelsea. I love people who support Chelsea,’ he said. Kate also worked with the children on making paper hands. The hands were used to make a Christmas tree collage on the wall. This was one of those engagements where Kate very much in her element, relaxed and enjoying herself. As it came time for Kate to leave one young man shared a hug. Kate, who has launched a crusade to improve children’s mental health with early intervention from experts, praised the children for their achievements while at the school. ‘Thank you everyone. It’s been so fantastic to see you all again doing amazing things. Keep it up and have a really happy Christmas,’ she told them before she left. Now to what Kate wore. We first saw this McQueen frock for the Jubilee River Pageant in June 2012, and again for a dramatic arts event at Buckingham Palace in February 2014. The dress is a custom version of this style by Alexander McQueen. Some may recall several celebrities wore the off the rack dress style, including Kim Kardashian and pop star Tulisa. The festive red was the perfect color for today’s engagement. Kate accessorized with her trusty ‘Power’ pumps from Stuart Weitzman. While the black suede version is no longer available in the US, Russell and Bromley still carries the style, it is called the Plunge (£185, about $275 at today’s exchange rates). The info about R&B still carrying the shoe comes via a comment on FB message, I apologize for not remembering just who shared that information. UPDATE Dec 23: We have heard from another reader that the Plunge is *not* the same as the Power pump, it is actually a style created jointly by Stuart Weitzman and Russell & Bromley. The shoe is priced much lower than the Power was: it is £185 versus £235 for the Power. Our reader also notes there are clear quality distinctions: the Plunge sole is synthetic leather as opposed to the real leather used for the Power sole. One other note: our reader says the plunge is a great repliKate with differences that wouldn’t be visible when the show is worn. 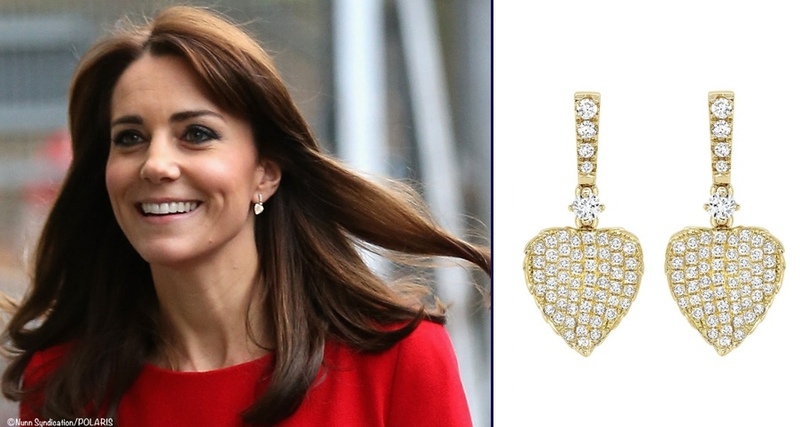 The Duchess wore her Kiki McDonough ‘Lauren’ earrings. With apologies for the brevity of the post, I am racing out the door and will update with more photos and info this evening. We leave you video of the event , it even includes the bongo drumming! This post makes me so happy. 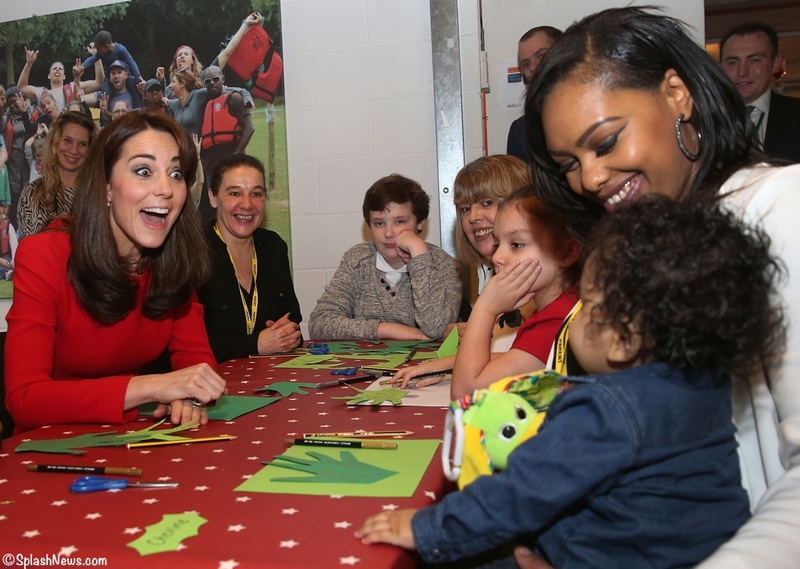 Kate looks so in her element and the kids seem to really enjoy being around her. The dress is one of my favourites too, but it holds a special place in my heart because I happened to see it in person (though from quite far!). 🙂 I have always loved Kate’s long hair but it’s nice to see her change it up, and this length is very flattering on her. I wasn’t a big fan of the earrings in their first couple of outings because they looked too heart-shaped for my taste, but they are really growing on me and I love the metallic shades with the deep red, very festive. Great outfit, great event! She looks lovely. Red is a good color for her, and I love her new hair cut. A sparkly snowflake necklace would have been a good addition to her ensemble. This is one of my all time favorite dress of Kate’s and she looks gorgeous every time she wears it. Very modern day Princess chic! Kate’s new haircut works so much better on her work engagements, never hiding her face and even on a windy day holds good. This is a working girl’s hair cut and she looks much younger with it. I think this is one of my favorite Kate dresses. It really flatters her in both cut and color. My favorite ensemble of the three so far is the one used in 2012 at the Jubilee River Pageant. I’m happy to agree that was a lovely hat with the first outfit. This dress has been great every time she’s worn it. And perfect for Christmastime! Like everyone else, I love this dress. The thing that occurred to me about it today though is how versatile it is. It went from a pageant-y outdoor event to an evening reception at the palace to a daytime event with children. And it looks completely appropriate at every single one with only some small accessory changes. Very impressive! They’ve taught her the ankle cross. All the royal women learn it. And now, Kate. Does it seem as though Kate isn’t wearing nylons anymore? I am one of the few people in my age group who wear sheer nylons and I loved that Kate would wear them. Love this look! I think she is. They’re just incredibly good quality so they hardly show at all. Love this dress, and I love the way she’s styling that new hair! So attractive! If I recall correctly, the event in 2012 was not a hot day. In fact it was raining quite heavily at times and there was apparently a heater on the barge to keep Her Majesty, the Queen warm. It wasn’t hot for the Queen’s Jubilee river pageant. It was cold and rainy. I remember the Queen and the D of E standing there in the cold rain, and, in fact, the Duke ended up ill and unable to attend the next day’s concert. Oops, I should have read the whole thread before commenting. I see my point has already been noted. Apologies! Lovely outfit. 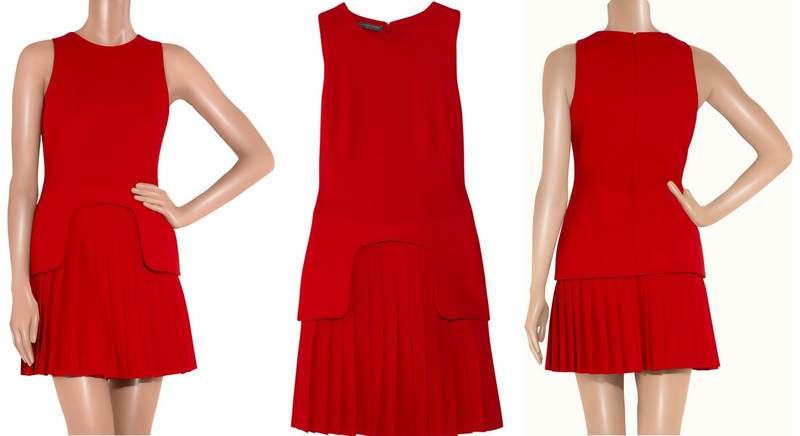 The dress is a stunning color, perfect for her and appropriate for a Christmas party. I love this look on her. I’ve always loved this dress and she looks amazing in red. I LOVE her new haircut. It’s business-like and regal. It very much says, “I’m not a girl, I’m a grown up royal”. And at this length we aren’t going to see her hair weighing down/taking attention away from her outfits as it has in the past. She looks great! Have always adored her in this dress. Polished but comfortable and that red is perfect for her. She looks to be in radiant health right now and so glad that the fringe is disappearing so we can see more of that handsome face. I would like this a lot more if the peplum went all the way around. Not a fan of the weird front cut-out…it’s like a uterus window. But I am really a fan of this haircut on her. She looks more fresh and modern. Thank you! I’m not the only one who doesn’t like this dress. the cut out in the front is so weird — from the front it looks like she has saddle bags. From the back it’s lovely, but the cut in front is just so strange. That said, she still looks lovely in anything she puts on! I agree with your thoughts on the peplum. I never could figure out why a huge chunk of it is missing…fashion statement, I guess. Love Kate in red! Such a great color on her. Also, the shorter hair has really grown on me. I think she looks fantastic, head to toe! So glad to see this McQueen again and to be able to get such a good look at it from all the photos. It sits way better without presumed extra layers bulking it up when Kate boarded the flotilla on the Thames and we have more views of it than at the Palace event. I hadn’t appreciated quite how it works at the back before, looking like a jacket over a pleated skirt and with a faint hint of vintage McQueen swagger in the curves of the peplum at the front. The pleats are hanging much better this time. Still loving the new hair-do, seriously hope it stays. Those poor old suede Weitzmans are getting quite a bashing, it seems unaccountable to stick to the same pair on subsequent outings when you have palace staff and wardrobe space on hand. But that’s Kate sticking to accessory choices again — including the clutch — and comfy feet are important for royal duties. I’m even enjoying the heart/leaf-shaped earrings this time. 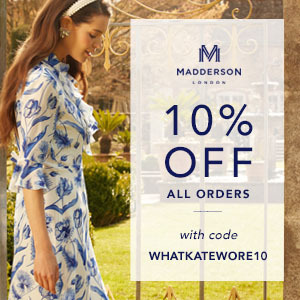 In illustration they look a bit sentimental but on Kate they’re lovely. Thanks for the prompt post! Is it just me or do her clothes look looser? This and the green coat and dress she just rewore both look looser than the first times she wore them. Maybe they are just letting them out? Crazy to think after two kids she’s even tinier. You know, I was thinking the same thing! It could be just the angles of the photographs? I noticed the same thing. However, if she is still nursing, it’s possible that she is thinner due to the calorie burn from that. In the year after both of my pregnancies I was at least 5 lbs thinner than my standard weight. It’s possible that she is a bit smaller now than she was, and that she will bounce back to her typical weight once finished nursing. This was something odd that I noticed too. I know we are discouraged (and I agree with that policy) from picking apart Kate’s weight and emphasizing her body rather than her actions or her style, but it made me wonder bc it seems to fit so differently each time she wears it. I’m going off the comparison photo with the three pics, most recent on the left. When she first wore it, it was very tight in the waist although she looks quite slim there overall. More recently it looks so much looser although she looks overall the same. I think the most likely answer is that her fitness routine has changed–I don’t think we’ve known Kate to be a runner but she probably does some weight training. Another possibility is that she has things taken in and out regularly (or even has them made in multiples?) but if alterations are the answer, that just makes one realize what an enormous amount of effort (and pressure) goes into her looks–imagine having a multi-person prep meeting for a dress in advance of an engagement! I know it looks fun to wear all those clothes but I certainly don’t think I could do all that trying-on and prep without getting utterly bored to tears! Kate, you make it look easy when it surely is not. I’m not sure I have got this reply in the right place, but with regard to the fit of the dress, I think the simplest answer is that Kate has a layer on underneath in the 2012 shot. If I remember it was a cold day and she was out on the river for some time. I also remember ready way back that Diana had very thin wool underwear she would sometimes wear under evening gowns if the venue was known to be cold. And Diana was quoted as saying that she was a walking advert for Damart!! UK maker of ‘thin’ thermal undies that has saved many of us from turning blue with cold while out on work engagements! The first time Kate wore this was standing on a draughty boat for four hours while steaming down river. She most likely had extra layers on to fend off hypothermia. The second time was an indoor event where the dress hung better but we had few pictures to judge. This time we can see more clearly how it looks when worn without extra layers, plus it still pulls a bit across the ribs when she’s seated. Of the three pics above I’d have said her legs look thinnest on the first outing in 2012. Overall I doubt her weight has altered much over that period. She was at her most wafer thin in 2011 post-wedding but has always looked in good health as she does today. Love the whole look! The colour and style are perfect for this engagement and Kate looks to be having a good time. Interesting that this, like the teal Emma Wickstead, is long sleeved with a pleated skirt, yet, in my opinion, this outfit is 100 times better. Part is probably the colour – Kate looks fabulous in red – but I think the main difference is the quality of the construction. This dress is superbly tailored. Once again, I feel that without the fascinator hat and long hair has her accessories, this dress is just not as impressive. It’s a great color on her, but this is a little boring. I never realized how much her hair added to her outfits until she cut it! And she’s worn those Stuart Weitzman heels so many times, they do look like they need a bit of a cleaning! Sorry Duchess, I still love you. Liz – you are so right. While I do love this new hairdo, you’re right, it’s just not “as impressive”, as when she had those long glossy locks. Would have been nice to see her accessorize with a long necklace or something. I love the look overall though. I have always love this dress. This is a very figure flattering dress on the Duchess.I appreciate how the pleats come out of the peplum like design on the hips.Its very finely tailored.Plus color suits her.Overall a nice look. I have always loved this dress and I think it still looks wonderful on Kate. It was very appropriate for this event. She looks very happy and it’s clear that she cares a lot about this cause. This is very figure flattering on the Duchess.The dress is very finely tailored.I appreciate the way the pleated skirt comes out of the peplum like design on the hips.The pleats are not ‘harsh’,unlike the pleats that I disliked of the Emilia Wickstead dress that she recently wore.Color suits her. The dress looks looser next to the 2012 comparison photo. I wonder if she had it let out a little or if it’s just the photos? The looser fit looks more elegant, in my opinion.